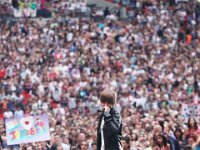 Gallery of Justin Bieber wearing chucks in casually and on stage, along with custom painted high top chucks. 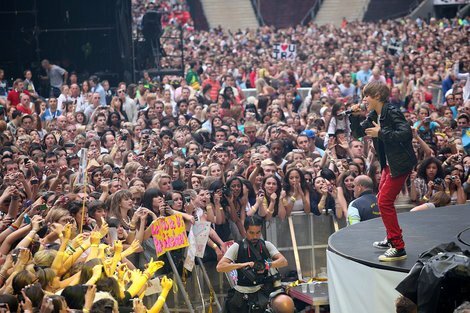 1 Justin Bieber Justin Bieber on stage wearing black high top chucks. 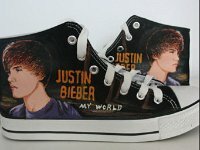 2 Justin Bieber Justin Bielber seated wearing optical white high top chucks. 3 Justin Bieber Justin Bieber wearing red high top chucks. 4 Justin Bieber Justin Bieber performing in black high top chucks. 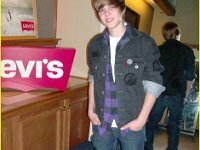 5 Justin Bieber Justin Bieber posing in purple and black monochrome high top chucks. 6 Justin Bieber Justin Bieber talking with a rapper wearing black high top chucks. 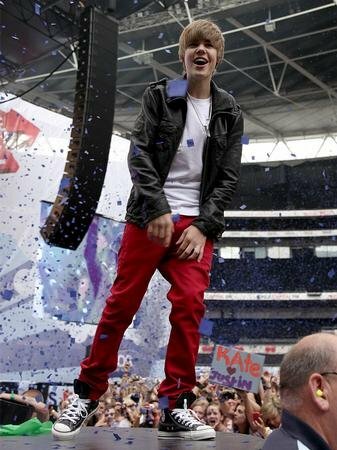 7 Justin Bieber Justin wearing red high top chucks, shot 2. 8 Justin Bieber Justin performing in black high top chucks. 9 Justin Bieber Justin performing in black high top chucks. 10 Justin Bieber Justin wearing black high top chucks. 11 Justin Bieber Wearing blue double details high tops. 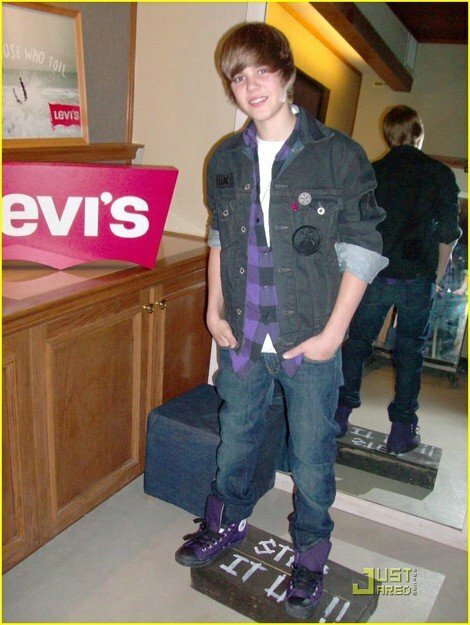 12 Justin Bieber Justin Bieber wearing black high top chucks at a photo session. 13 Justin Bieber Justin Bieber wearing red high top chucks. 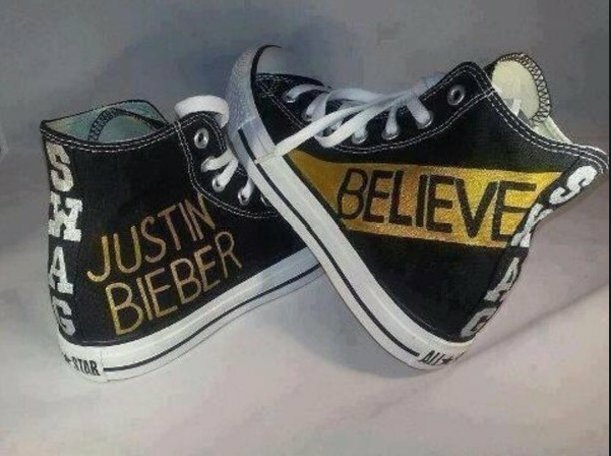 14 Justin Bieber Justin Bieber wearing black high top chucks. 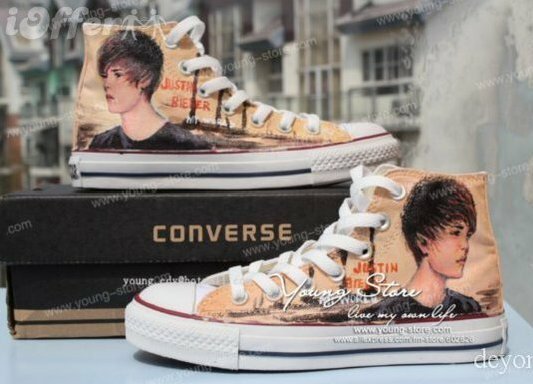 15 Justin Bieber Justin Bieber wearing red clay low cut chucks. 16 Justin Bieber Justin Bieber wearing black high top chucks. 17 Justin Bieber Justin Bieber wearing red high top chucks. 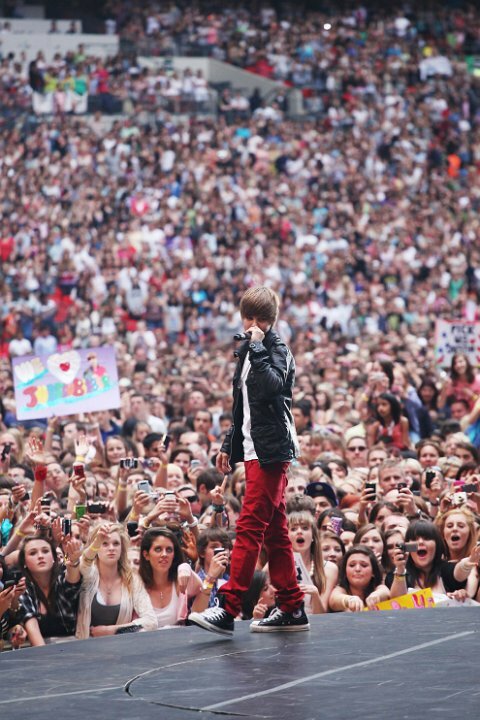 18 Justin Bieber Justin Bieber carried by fans. 19 Justin Bieber Justin Bieber talking to a dolphin wearing optical white high top chucks. 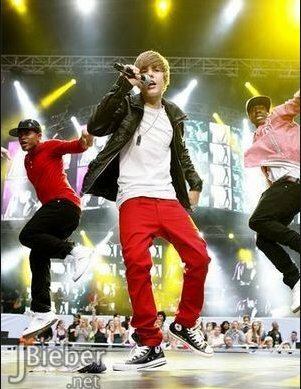 20 Justin Bieber Justin Bieber wearing black high top chucks in performance. 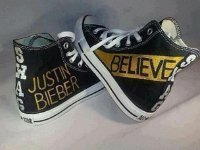 21 Justin Bieber Justin Bieber wearing black low cut chucks. 22 Justin Bieber Justin Bieber wearing red low cut chucks while bicycling with Selena Gomez. 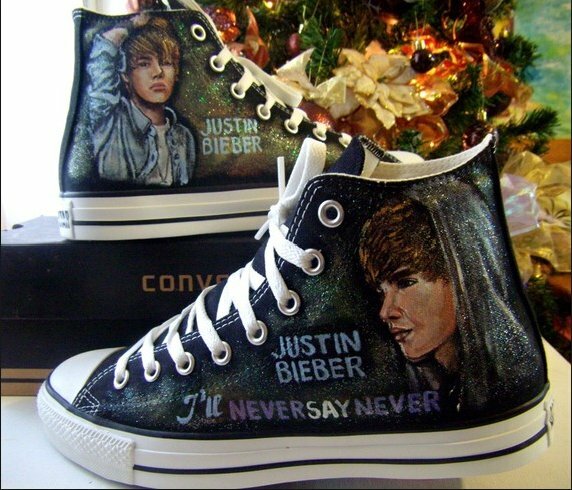 23 Justin Bieber Painted Chucks Custom painted black high tops. 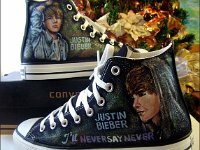 24 Justin Bieber Painted Chucks Custom painted black high tops. 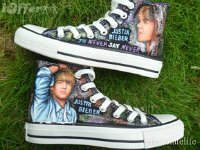 25 Justin Bieber Painted Chucks Custom painted black high tops. 26 Justin Bieber Painted Chucks Custom painted optical white high tops. 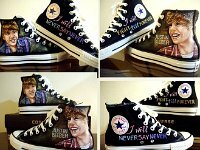 27 Justin Bieber Painted Chucks Custom painted black high tops. 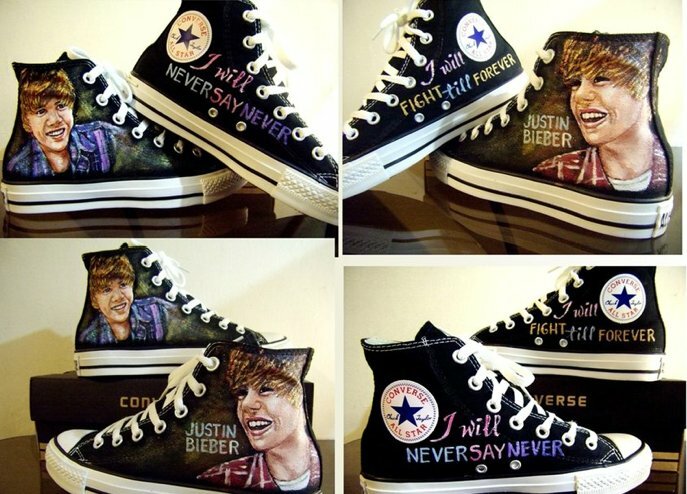 28 Justin Bieber Painted Chucks Custom painted black high tops. 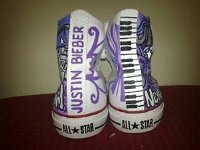 29 Justin Bieber Painted Chucks Custom painted optical white high tops. Photo gallery of entertainer Justin Bieber wearing a variety of chucks, mostly high tops. The painted shoes shown are done by independent companies and not actual issues by Converse.